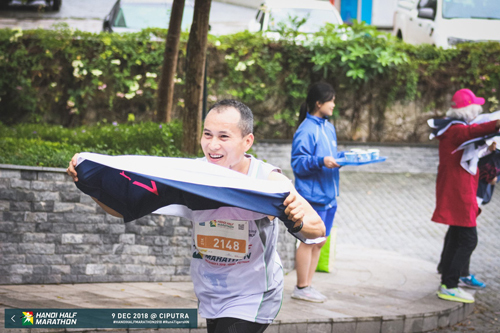 On 9 December 2018, Hong Ngoc General Hospital has accompanied with nearly 700 runners from more than 30 countries in Hanoi Half Marathon in Ciputra International City, Hanoi. This is the third time the hospital support the event as medical sponsor. Known as the oldest marathon race in the North of Vietnam, at first Hanoi Half Marathon only attracted expats living in Vietnam. However, after 12 years, the number of Vietnamese runners participating this marathon has dramatically increased, equal to that of foreigners. Ciputra International City, which hosts the marathon, boasts an open ecological space with fresh air and lush green scenery. The races including 21km, 10km, 5km, 3km, and 1km allow participants at all ages, from professional runners to little athletes, to join in and have fun on the races. Themed as “Run for tigers – Tigers belong to the nature”, Hanoi Half Marathon 2018 spreads out the meaningful message of protecting tigers. The even aims to raise public awareness as well as encourage the community to commit not to using products made from tiger, thus helping to put an end to the hunting, farming and trade of tigers in the country. The money collected from the marathon will be transferred to Education for Nature – Vietnam (ENV) for further activities. 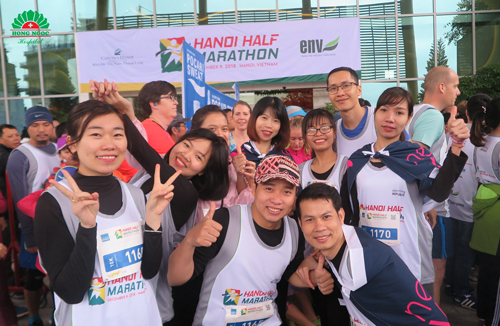 Hong Ngoc General Hospital has supported Hanoi Half Marathon for the third time. This year, two ambulances, one doctors and 6 nurses were assigned to best support runners participating the event. 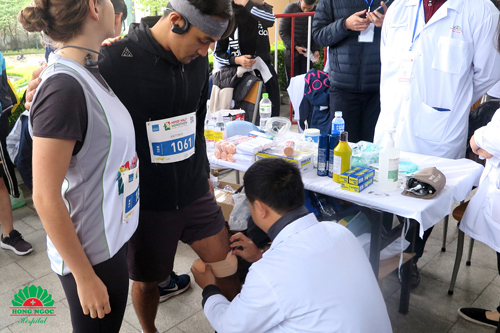 Necessary medications and other medical materials were carefully prepared at three medical booths, meeting demands of runners before, during and after the races. In addition to the role of medical sponsor, Hong Ngoc General Hospital was honored to be the largest group with 40 participants in 10km and 21km distances. 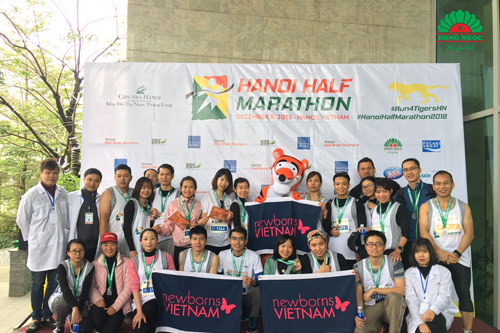 With each completed km, they have contributed a small amount of money to Newborns Vietnam – a UK registered charity aiming to save lives by reducing neonatal mortality and promoting the health of newborn children and their mothers in south east Asia with a specific focus on Vietnam.